The recent groundbreaking ceremony for Hatch + Ulland Owen’s design of Acton Academy new campus was featured in the November issue of Construction News. 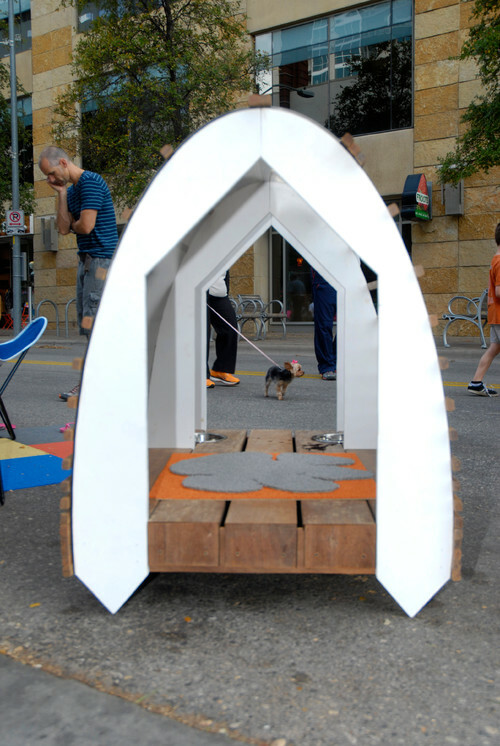 Saturday, November 10th, Barkitecture took over the 2nd St. District as people walked the gallery of dog houses along the street. A project of Animal Lovers of Austin, Inc., Barkitecture brings together the city’s best architects and designers to create one of a kind dog houses. These works of art are then sold via silent auction during the event. Proceeds from the event benefit local dog rescue organizations. h+uo has entered the competition a few times over the years. This year, the idea behind the design was to take the traditional dog house shape and envelope it with a modern and sustainable exterior. The traditional dog house shape can be seen as the “negative” or inside border of the framing. Salvaged Ipe wood (provided by Franklin Alan) was used for the base and as the securing mechanism for the plastic covering. Ipe, which is a very hard wood, required pre-drilling for all screws. The material used for the roofing/wall material is Polygal (purchased at regal Plastics). This material was a bit of a challenge to work with as its rigid nature made bending the materials around the arc of the framing fairly difficult. With a little team work. we were able to fasten it down. We’re pretty thrilled with the result! Special thanks to Bravo Interior Design for their input on the design! Also of interest! – This year, our design was featured on houzz.com! Click here to read the full article and to see images of other dog house designs that made a splash at this year’s event. FROM DESIGN TO THE STREET!